← Everybody in the (Pyrazine) Pool! Wine lovers that travel to Piedmont looking for the colors are typically chasing the deep, brooding red of a glass of Barolo, or perhaps the red-and-gold leaves of a vineyard in autumn. While these are certainly worth traveling for, Piedmont also has some unique—albeit tiny—architectural gems that scream with character and color, and should make for a good side trip in the midst of any serious wine tasting tour! Barolo’s Brunate Chapel: The Chapel of the Madonna delle Grazie (often referred to as the Capella della Brunate [Brunate Chapel] or the Capella del Barolo [Barolo Chapel]) was built in 1914 as a shelter for vineyard workers in case of heavy rain or hail. The chapel was originally frescoed by Giovanni Savio (1863–1950), who hailed from the nearly town of La Morra. The chapel, which is located in Le Brunate—one of the most important crus of the Barolo DOCG—was purchased by the Ceretto family in the early 1970s, along with the 6 hectares of the surrounding vineyards. When it was purchased, the chapel was nearly in ruins, showing the signs of years of neglect. In 1997, the Ceretto family approached David Tremlett, an acclaimed English artist with a reputation for installation art and site-specific works (in addition to painting and sculpture) with the idea of renovating the structure. Tremlett loved the idea and chose to collaborate with his friend Sol LeWitt on the project. Sol LeWitt (1928–2007) was an American artist well-known for wall drawings, large-scale installations and conceptualism. 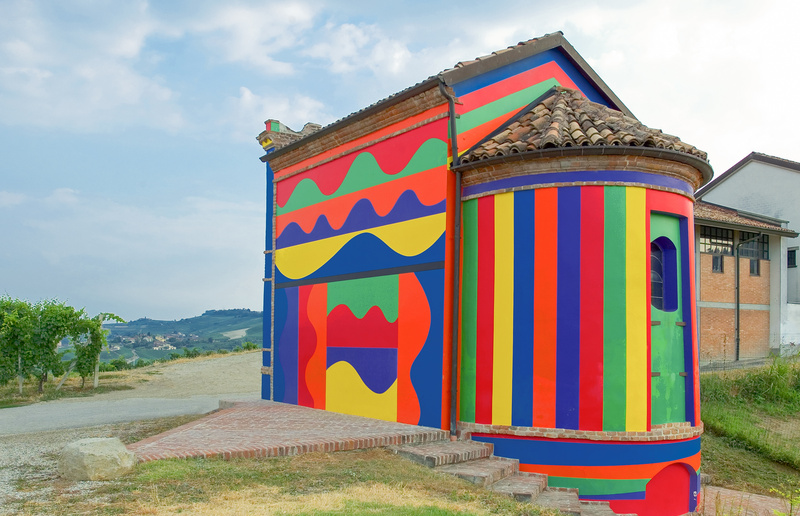 For the Brunate Chapel, Tremlett worked on the warm, serene interior and LeWitt created the lively, colorful exterior. 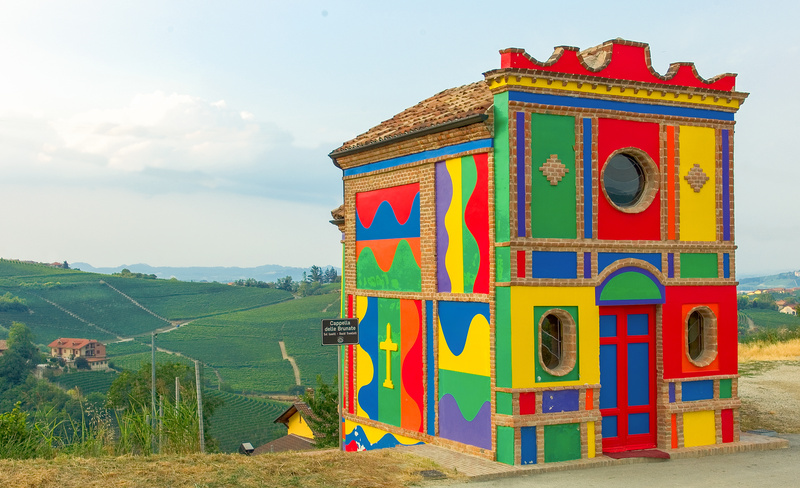 As is easy to imagine from the appealing colors and scale of the building, the Brunate Chapel is one of the most recognized and visited spots in Barolo. 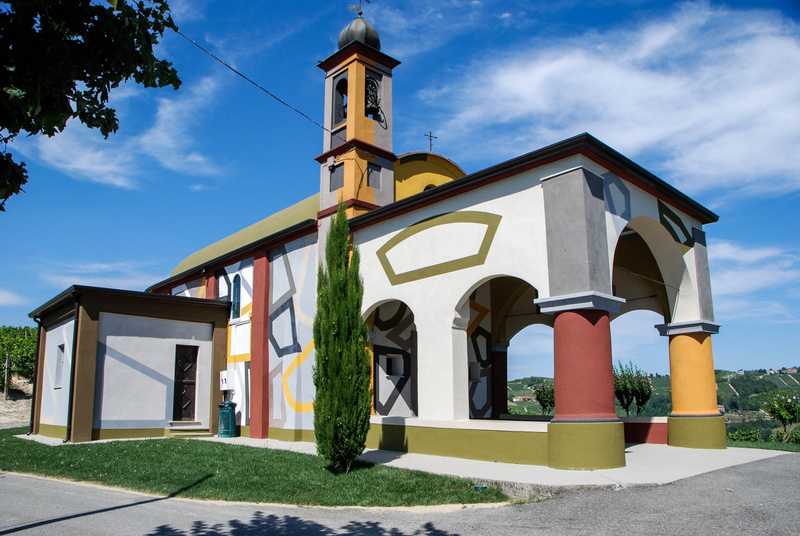 Asti’s Chiesetta di Coazzolo: La Chiesetta della Beata Maria Vergine del Carmine, affectionately known as the Chiesetta (little church) of Coazzolo, is located in the Asti DOCG area. Nearly 20 years after completing the renovations of the Brunate Chapel, David Tremlett returned to Piedmont to repaint and rejuvenate the little church using wall drawings and acrylic paints. The colors of the Chiesetta—which include sienna, yellow, and olive green—are more natural in style and subtle than the bright bursts that decorate the Brunate Chapel. The restoration of the Chiesetta is the result of a joint venture between London’s Genillard gallery and Silvano Stella, the owner of the Coazzolo Castle.